Maharashtra Academic Authority (MAA), Pune has scheduled to release the D.El.Ed 3rd round seat allotment result today, 19th July. All the hopefuls who have applied to get admission in Diploma in Elementary Education course can check the 3rd allotment list. The list is going to be displayed on MAA official portal, maa.ac.in. hopefuls who have listed in the 3rd round seat allotment result are eligible to get admission in D.El.Ed course in various affiliated colleges of MAA. Candidates will get admission for the academic year 2018-19. Candidates can check more details from the following article. SCERT, Maharashtra has accepted applications from all the eligible aspirants for admissions of D.El.Ed/D.Ed courses. The application process was continued from 4th June to 20th June. A huge number of eligible aspirants having the suitable educational qualification and seeking to become the elementary school teacher have applied for the D.El.Ed courses. The SCRET Maharashtra has done with the document verification process from 5th June to 21st June and released the provisional merit list on 23rd June. Now, the aspirants who had listed in Maharashtra D.Ed provisional merit list can check the 1st round seat allotment results. Candidates who got allotted admission in the 2nd round will have to pay the requisite admission fee and report at the allotted colleges within specified dates. Candidates can visit any of the websites, deledadmission.in, maa.ac.in, mscert.org.in to download the Maharashtra DELED 2nd allotment result 2018. D.El. Ed. Admission, 2018-19. Third Round admission list published. Applicants who had applied for Maharashtra D.El.Ed admission and has shortlisted in provisional merit list can now proceed to check the 3rd round seat allotment result. Candidates can lock the choices and can pay the admission fee. Aspirants who allotted admission in the 3rd round seat allotment list will have to pay the fee and report at the allotted college between 19th July to 23rd July. Search for the D.El.Ed 3rd Seat Allotment Result on the homepage. 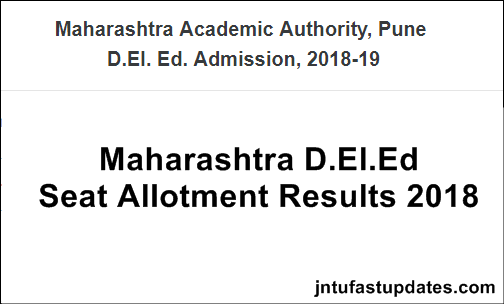 The Maharashtra D.Ed seat allotment result 2018 will be downloaded. Check it and take a printout if required for further reference.